Prior work in sarcasm detection uses indicators such as (a) unigrams and pragmatic features (such as emoticons, etc.) by González-Ibánez et al. (Proceedings of the 49th annual meeting of the association for computational linguistics: human language technologies: short papers-volume 2, pp 581–586, 2011), Carvalho et al. (Proceedings of the 1st international CIKM workshop on topic-sentiment analysis for mass opinion. ACM, pp 53–56, 2009), Barbieri et al. 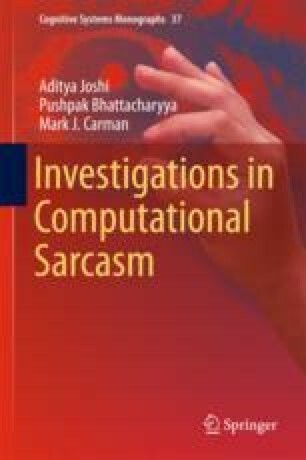 (Modelling sarcasm in twitter: a novel approach, ACL 2014, p 50, 2014b), or (b) patterns extracted from techniques such as hashtag-based sentiment by Maynard and Greenwood (Proceedings of LREC, 2014), Liebrecht et al. (The perfect solution for detecting sarcasm in tweets# not, 2013), a positive verb being followed by a negative situation by Riloff et al. (Proceedings of the conference on empirical methods in natural language processing 2013, pp 704–714, 2013), or discriminative n-grams by Tsur et al. (ICWSM, 2010), Davidov et al. (Proceedings of the fourteenth conference on computational natural language learning. Association for Computational Linguistics, pp 107–116, 2010b).